Insaf, 32 years old and mother to two toddlers, works at the Sindyanna of Galilee Visitors Center at Kufr Manda. She originally came here to learn to weave baskets in order to improve her income, joined a mixed learning group of Arab and Jewish women, and before long she was teaching the craft to women in the village and elsewhere. Kufr Manda, near HaMovil Junction, is one of the more conservative villages in the area, with a high unemployment rate – especially among women. 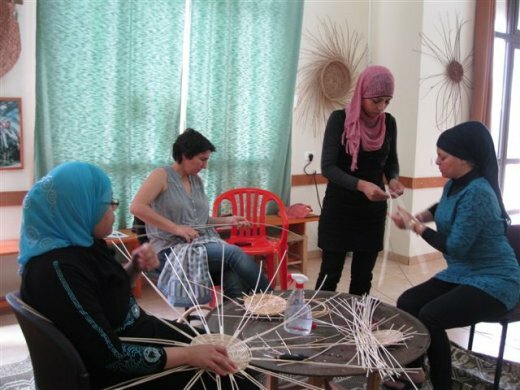 The Visitors Center teaches Arab and Jewish women basket-weaving and handicrafts, helps them sell their products, holds Hebrew classes, hosts groups of visitors from across the country and around the world, and arranges for visits with women in different creative fields. Insaf was born to a conservative family. Her mother, 60 today, married at 16 and gave birth to 14 children at intervals of 1-2 years. She finished only one year of education but taught herself to read and write. All of the children were outstanding students, and the teachers encouraged them to stay in school, rather than marry after ten school years. Not all of Insaf’s sisters stayed in school, but she, stubborn and nearly a nest egg, did. In order to finance her studies, Insaf worked for two and a half years at the Tefron sewing workshop in Sakhnin. ”It’s not popular for a girl to work outside of the village” she says, ”but there was an organized bus shuttling women to the workshop and back, and it was an acceptable arrangement. My sister worked with me as well.” Her brothers encouraged her to study and also helped her financially – she has a brother who is an engineer and another who studied mathematics at the University of Haifa, but has not found work yet. Insaf studied business management and computer science at the Mar Elias College in I’bilin, then completed her studies for a BA at the WIZO Haifa Academy. Only after she finished her degree, at the age of 24, did she marry. Insaf came upon the Visitors Center by coincidence. While standing in line at the doctor’s office, she saw a woman with a charming basket and asked about it. ”I came to learn to make baskets and earn some money,” she says, ”but I got so much more than that. First of all, I love the meetings with the Jewish women and the visitors from abroad. These give me a little taste of the great wide world. I made new friends, invited them over for a fast-breaking feast during Ramadan, and they invite me over as well. I love hearing how they live and what they think about. They are more independent and active, and they have far less restrictions than we do. Insaf feels the young generation of women in the village has come a long way compared to the mothers’ generation before it, but she is also worried about the growing phenomenon of girls marrying early without a trade or occupation. ”We’re moving forward, but without occupation or income it’s an uphill battle,” she summarizes.